I have always been a dreamer. As a child I dreamt of travelling to realms such as Faraway Land and NeverLand, my young mind heavily influenced by Enid Blyton. As I reached teenhood, I started pining for cities like Paris and Venice, the Capitals of Romance. Things changed as I started my career and my job left me gasping for a break. Then, I wanted to just chill out in places like New Zealand (blame it on the LOTR and Narnia movies) and go trekking /camping in the lush green forests there. Circa 2013, things have changed anew. I believe I am becoming a more ‘responsible traveller’, as middle age beckons from not too far. I try to fit in all the elements that my family would want from visiting a place. In this aspect, one city stands out as one of the perfect destinations – Kuala Lumpur. As I browse through the ‘Places to visit in Kuala Lumpur’, I am increasingly convinced of the fact that no one packs in as much as this city in Malaysia. It caters to everyone’s whims and fancies. And yet, I would not want to lose myself amidst the throng at touristy places. So, here I am, looking for those little hide-outs in this great city. Nothing gives me more pleasure than stumbling upon the little known recesses of the city that lends oodles of character to the city. Come away with me then, and together we shall go off the beaten track in Kuala Lumpur! Kampung Baru – What’s that? That’s a village smack in the middle of the bustling city, still having an old-world air about it, unaffected by city rules. Who would have imagined its existence, looking at KL’s skyscrapers? A must visit before it crumbles against the real estate demolition brigade. Heritage buildings – KL is dotted with various colonial gems, the architecture speaking volumes of the days of yore. What better way to discover these over a leisurely walk and a round of dialog with the old time settlers? We should look out for Merdeka Square, I hear. Sin Sze Si Ya Temple - Here sits Madam Wong, the resident caretaker of the temple. Let’s ask her to untangle our future, conferring the fortune sticks known as chim. Alternately, we can circle under the main altar three times and let good fortune smile on us. 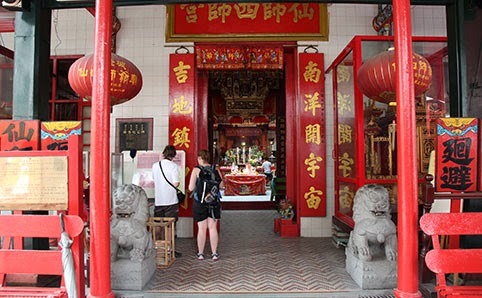 Brickfields – A walking tour in a neighbourhood that used to produce bricks and we shall discover delightful shops, houses, churches, temples, shrines and art galleries that were built during the period 1920-1980. Rumor has it there are secret dining places. How about setting out to locate them? 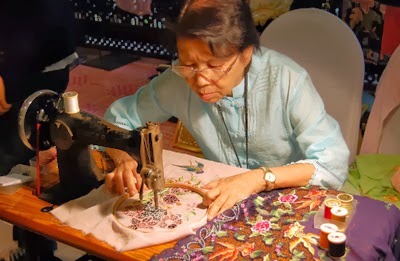 KL Craft Complex – Just around the corner from Petronas Twin Towers and Bukit Bintang lies this beautiful complex, showcasing the traditional art and craft of Malaysia. 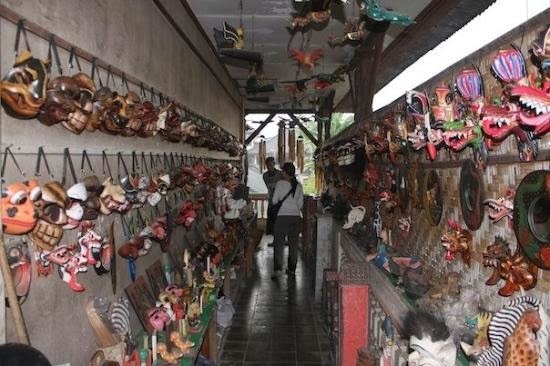 There are also the artists’ workshops, each spilling over with magnificent handicrafts consisting of batik art, paintings and wood carvings. Perhaps we could stop by, say a little hello and marvel at their creations. A little souvenir to remember these artists would be a good idea, methinks. Lake Garden Park – A nice place to rest our heels and cool off amidst the pristine surroundings set around a beautiful lake. Besides attractions such as tropical trees, colourful flowering bushes, waterfalls, landscaped gardens and a deer park there is a huge children’s playground. I think my son would enjoy the park more than us! Chin Woo stadium – Just before sunset, we shall gaze wide-eyed at the genteel residents practicing the dying art of Wushu in the stadium and wonder how many of our own sports we have lost. Perhaps one of the kind men would point us towards the specific nook at the edge of the car park on the hill and we shall enjoy a ravishing sunset view of KL with the Petronas Towers, heritage buildings and verdant green forest as its backdrop. The food bike – Let’s try flagging down a food bike laden with treats such as ice cream, buns, biscuits and sweets while keeping a look out for the puttu mayam man, his bike’s trunk holding string hoppers, desiccated coconut and crunchy brown sugar. A sweet start to our foodie adventure in KL! The best breakfast place – Every city has its own legendary food place. For KL, it is Yut Kee, the best breakfast place in town. Yut Kee is famous for its chicken chops that have been on the menu for about 80 years now. For pork lovers like us, roti babi is the way to go! These are pockets of fried dough stuffed with shredded pork and caramelised onions, dipped in Worcestershire sauce. Slurp! Roast duck at Sze Ngan Chye - Located in front of a textile shop along the busy Petaling Street, there stands the blink-and-you-missed-it shop that regularly sees a serpentine queue for their extremely succulent charcoal-roasted duck, which usually runs out before 2 pm. The establishment, belonging to the Chong family, has been around since the 1950s and it is still going strong. We should start really early for lunch and try to partake in this local delicacy. 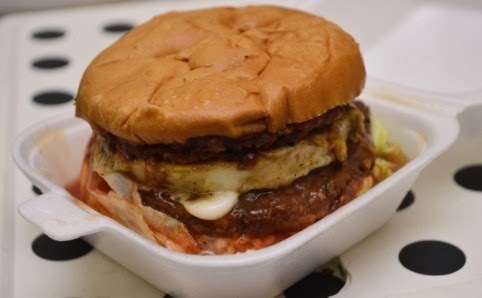 Street food fest – We have our vada pavs and KL has its Ramly burgers! These are to be found almost everywhere and yet they are more popular in the TTDI stand. Drool check! Dining under a flyover – I have always preferred to eat what the locals eat. And for that, we shall head over to Warung Cherry, a food stall under a flyover that lays out the best nasi campor spread. Everything that is on offer, right from the meat to the fish, is fresh, home-cooked and authentic. Apparently, the ayam goreng and sup tulang there should not be missed. 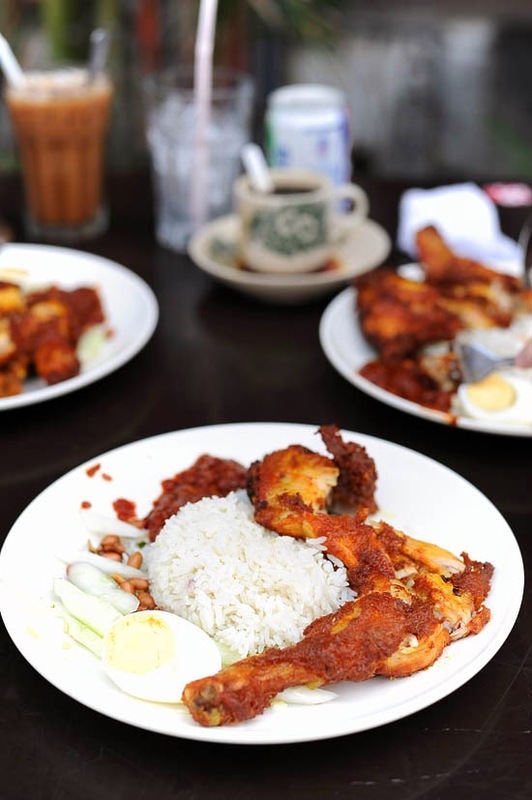 The best Nasi Lemak – We cannot leave without sampling this Malaysian staple that is basically a delicious concoction of coconut milk-infused rice served with hard boiled egg, anchovies, peanuts, cucumber and spicy-sweet gravy. For that, we shall head out to Village Park Restaurant, which serves one of the tastiest nasi lemaks in town. I am not a big shopper, much to the husband’s relief. But a girl’s got to shop a little, hasn’t she? I read somewhere that on a good day you can spot 1,000 malls from the Petronas Towers, literally. But that’s not where we are headed. Connaught Pasar Malam – Visiting this 2.4 km long night market is as good as a hard trek! It is a one-stop shopping solution with loud music and jostling crowds, where people mostly come to buy the coveted stinky tofu. They say, everything is available here, right from the pin to the elephant! Junk Bookstore – Even with a kindle in my possession I feel the need to surround myself with books. For that purpose alone, we shall visit the Junk Bookstore, a shop crammed with second hand books, comics and LPs. I hope to wipe off the dust of a few first editions and make them my own. Pasar Seni – This is KL’s original Central Market housing a huge variety of Malaysian clothing, arts, handicrafts, souvenirs and restaurants. I wonder if I shall be able to afford the stuff there, but there is no harm in window gazing at the beautiful traditional arts and clothing of Malaysia, is there? Sin Hua Bee bakery – My family and friends will never forgive me I return empty handed. If I know them well, they would be more pleased to have a little bite of KL, besides the ubiquitous fridge magnets. Hence, a few packets of ga lui beng (traditional Chinese wedding biscuits) from Sin Hua Bee bakery and my shopping is done. I am not sure if I shall be able to locate all these hidden gems and there are so many of them! Who knows, maybe I shall discover some more on my quest. I hope to travel to KL in the near future and shall definitely check out World’s Best Online Travel Fair. I can’t wait to land there and start exploring Kuala Lumpur! PS: I finally managed to fly to Kuala Lumpur, an all expenses paid one at that! Won a contest after all! I am visiting KL in January 2014, and this has been such a helpful post. Cheers, mate! KL is indeed a great tourist spot. Great post Sangeeta. Thank you! My research background has worked a little here, at last! Thank you so much! Quite an unexpected win!